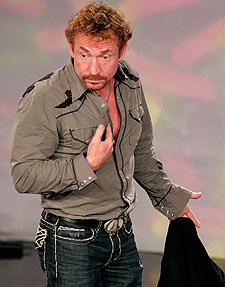 Danny Bonaduce won’t be charged with battery stemming from his shocking caught-on-tape brawl with Jonny Fairplay. Though Fairplay filed a formal complaint – after some teeth were reportedly knocked out – the Los Angeles district attorney investigated the incident and decided there wasn’t enough evidence to charge Bonaduce with a crime. According to papers filed by the DA, "It did not appear that the suspect intentionally tried to cause injuries, but simply reacted to the victim's actions." During Tuesday’s taping of the Fox Reality Channel Really Awards, Fairplay jumped on Bonaduce and wrapped his legs around him. In reaction, Bonaduce tossed him backwards and Fairplay landed on his face.